My love of quilting began at a very early age when my mother taught me to piece and hand quilt. I made my first custom quilt when I was nine years old. I often pretended to be sick so I could stay home from school and quilt with the ladies at church on bee days. Over the years, I made several scrappy quilts while raising my two children. In the late eighties, I discovered the wonders of rotary cutters and strip piecing and my life hasn’t been the same. It didn’t take long for me to find that my hand quilting hobby was not keeping up with my quilt piecing hobby. 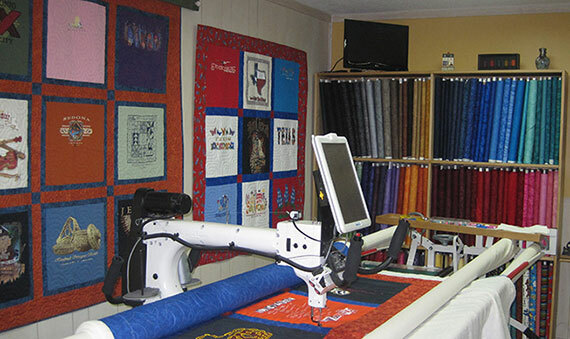 So I bought my first quilting machine in 1995 and soon began machine quilting for customers. I am now on my third quilting machine and quilting has become a full-time business. My husband Tommy retired in early 2012 and works with me. Quilts that I quilted have been published in Colorful Quilts, A Journey Through Fabric by Cynthia Regone as well as Simple Strategies for Block Swap Quilts and Patchwork-Play Quilts by Lynn Roddy Brown. I was also featured in an article about quilting in Katy Magazine. And quilts that I quilted for Red Crinoline Quilts (formerly Bonnie Blue Quilts) were featured in McCall’s Quilting Magazine, Primitive Quilts and Projects, and on the covers of Quilt Magazine and Quilt Mania, a French magazine published in several languages. Most recently, my quilting was published in Tributes and Treasures, a quilting book by Paula Barnes and Mary Ellen Robison of Red Crinoline Quilts. 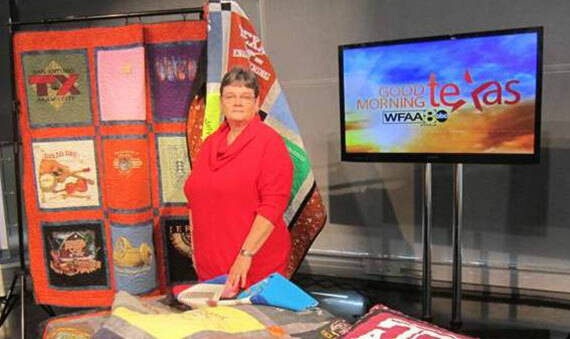 I have appeared on the Dallas ABC affiliate’s “Good Morning Texas” with some of my T-Shirt quilts. Today, I’m helping people from all over preserve their memories with quilts made from their t-shirts. You can order your own tee shirt quilt from me today! 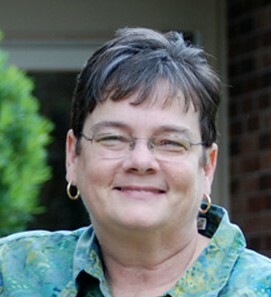 Member of the West Houston Quilter’s Guild, IMQA, Central Texas Longarm Guild and FML Longarm Association. They are absolutely beautiful and perfect! I just wanted to take a minute to say thank you from the bottom of my heart for the girls’ quilts! They were beside themselves with emotion when I gave them to them. They are absolutely beautiful and perfect. I have had SO many compliments and people asking who made them! I have already given your information to 6 people!! This was so special for them, and you will never know how much I appreciate the care you took making them and the time you put in. Thank you so very much.